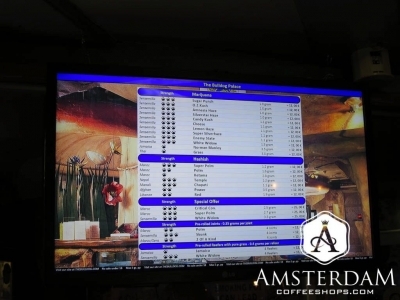 Bulldog Palace is located at the Leidseplein (Leiden Square). This is one of the busiest sections of the city, packed with restaurants, nightclubs, and various facets of shopping. The Bulldog is far from a business with a minor presence here. In fact, it seems to be a cornerstone of the square. With its large neon signs, three separate businesses (coffeeshop, nightclub, and souvenir shop) on premises, and ample out-front seating, one simply cannot miss it when visiting the area. There is interesting history behind this particular location, which opened its doors in 1985. 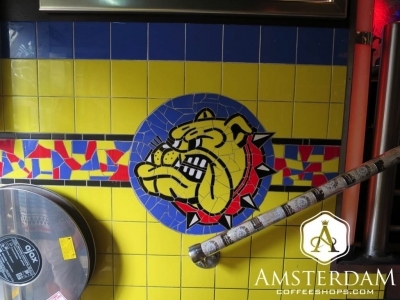 The original Bulldog coffeeshop was one of Amsterdam’s first, with roots dating back to cannabis prohibition. 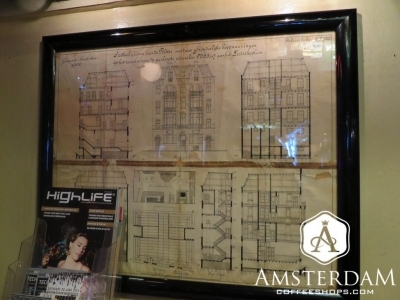 The owners were notorious for defying Amsterdam’s cannabis laws. The original location was raided so many times that the exact number has been lost to history. Once cannabis toleration policies came into effect, however, The Bulldog was poised to thrive. Within a decade they would become the largest chain of coffeeshops in the city, and amass enough resources to buy the location Bulldog Palace now occupies, former police headquarters #14. Is it irony or poetic justice? It all depends on how you want to look at it. First, you should know that the coffeeshop only makes up a small portion of this building. Technically speaking, it is The Bulldog Ex-policestation, which is found in the old jail below The Palace. 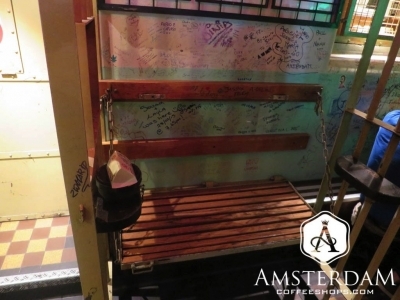 Alcohol cannot be served in coffeeshops, so this is considered a separate business. This may be the most interesting part of the whole operation, though. Management has preserved a great deal of the old jail. 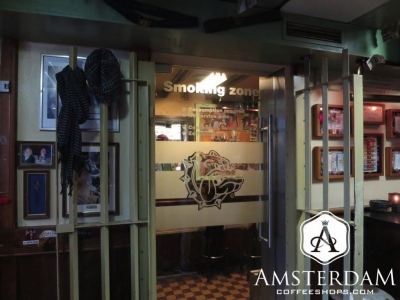 Steel bars are found throughout, and an old cell houses the shop’s closed-off smoking room. It is essentially a museum in here now, packed with interesting old photos and artifacts from the years of alcohol prohibition. 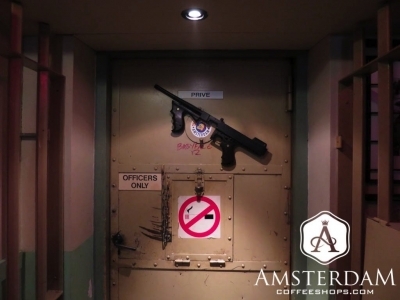 There is even an original (deactivated) Thompson 1928 machine gun hanging on a back door, arguably one of the most emblematic pieces from this era. Upstairs is the large Palace bar/restaurant. 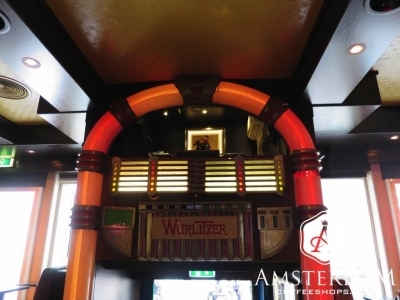 The décor is modern, perhaps barring the giant classic Wurlitzer jukebox that is actually a DJ booth. It is positioned over the entrance, so you walk below it as you enter. The atmosphere in here is “Grand Cafe”. Think of it as part high-end nightclub, part restaurant. 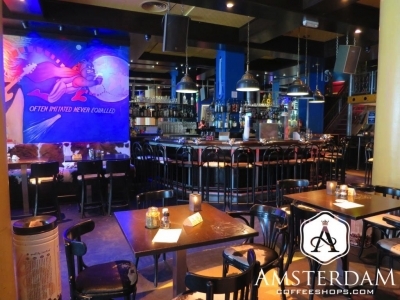 The place is clean, the furniture well maintained, and the atmosphere is lively. 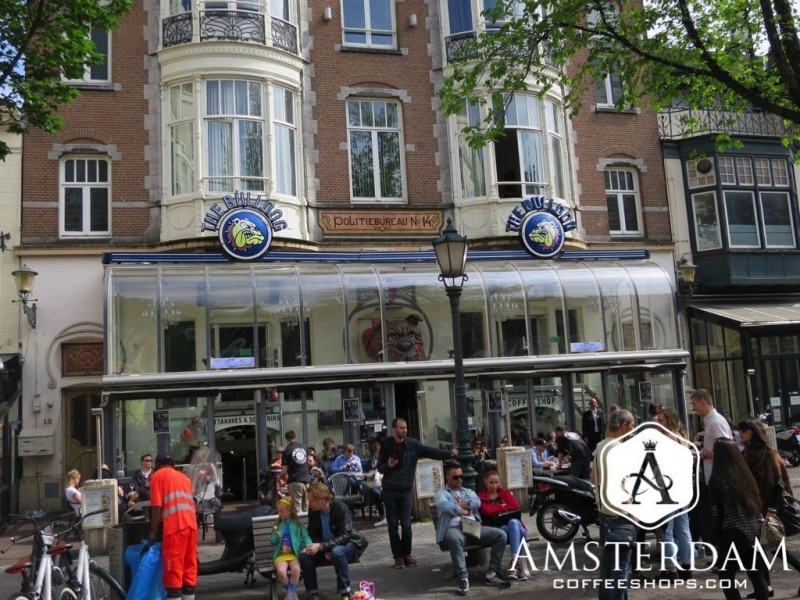 While The Bulldog Palace is not the most traditional Dutch coffeeshop, it is one of the most iconic, and its popularity is a clear reflection of that. The Bulldog Palace (Bulldog Havri) resides in an old police station, now museum to prohibition-era crime and punishment. This is one of the most interesting shops to visit in the city. And with its large nightclub and restaurant upstairs, perhaps most fun. We rate this establishment a must-see.